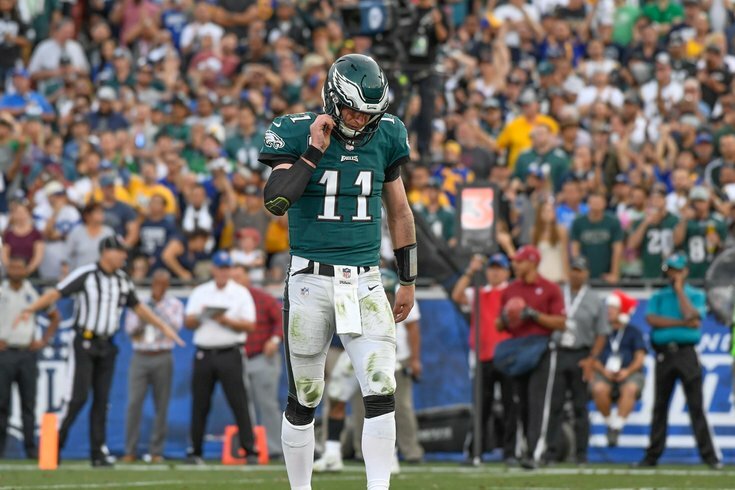 Earlier this week, the Philadelphia Eagles placed three more players on injured reserve, and a fourth, Carson Wentz, now has a "stress injury" (aka a stress fracture) in his back, and is not playing in this game. The Rams, meanwhile, have a completely empty injury report. That's right -- They have no players on their injury report in Week 15. • QB Carson Wentz: It's laughable that the Eagles even bothered to list Wentz as "doubtful" on Friday, but they later ruled him out. It's unlikely Wentz sees the field again in 2018. • LB Jordan Hicks: Hicks is out, and the Eagles' top two remaining linebackers -- Nigel Bradham and Kamu Grugier-Hill -- don't have full usage of one (each) of their hands against one of the best running backs in the NFL. • DT Timmy Jernigan: Jernigan played 20 snaps against the Giants three weeks ago, but he had some back spasms flare up on him prior to the Eagles' win over the Redskins, and did not play, despite being on the active 46 for the game. He missed last Sunday against Dallas as well, and will not play against the Rams. • CB Sidney Jones: Jones has suffered several setbacks this season to a hamstring that has never really gotten better. • LG Isaac Seumalo: Seumalo was injured against the Cowboys, and Stefen Wisniewski filled in at LG. Wis will almost certainly start on Sunday in Los Angeles, and he'll have his hands full with Aaron Donald. • RB Boston Scott: Why?!? He was one of the rare players I was curious to watch in this game. • OT/OG Matt Pryor: Pryor may get some action once the Eagles are mathematically eliminated, but that won't come until Week 17, at the earliest. • CB Ronald Darby (IR): Darby was up and down as a starter this season before he tore his ACL. At a minimum, he's a lot better than the players who are trying to replace him. • RB Jay Ajayi (IR): Ajayi was acquired from the Miami Dolphins at the trade deadline last season, and he was a contributor to the Eagles' Super Bowl run, carrying 70 times for 408 yards (5.8 YPC) and 1 TD during the regular season, and then adding 184 yards on 42 carries during the playoffs. In four games this season, Ajayi rushed 45 times for 184 yards and 3 TDs, while playing through a fracture in his back. He was placed on IR with a torn ACL. • S Rodney McLeod (IR): McLeod is done for the season after tearing his MCL during the Eagles' win over the Indianapolis Colts. On the season, he had 10 tackles and four pass breakups, which doesn't properly convey the positive contributions he made in the first three games. McLeod was replaced initially by Corey Graham, and later Avonte Maddox. • WR Mike Wallace (IR): Wallace, formerly the Eagles' No. 2 receiver, broke his fibula against the Buccaneers. Doug Pederson noted that Wallace is doing well, but he is not yet ready to return. • WR Mack Hollins (IR): The Eagles will also be without their No. 4 receiver, as the Eagles placed Hollins on IR with a groin injury. Like Wallace, Hollins is not yet ready to return. • ST Chris Maragos (PUP): Maragos is still recovering from a serious knee injury suffered Week 6 last year against the Carolina Panthers. • OT Jordan Mailata (IR): Mailata's IR designation came as a surprise. It would have been nice to get a look at him in a potentially meaningless Week 17 game, but that won't be happening. I can't believe I even bothered typing those seven names. • WR Cooper Kupp (IR): Kupp tore his ACL and is done for the season. In eight games in 2018, Kupp had 40 catches for 566 yards and 6 TDs. As a rookie in 2017, Kupp had 62 for 869 yards and 5 TDs. He is already one of the best slot receivers in the NFL. • RB Malcolm Brown (IR): Brown is a reserve running back, who had 43 carries for 212 yards (4.9 YPC) in 2018. He's done for the season with a clavicle injury. • OLB Dominique Easley (IR): Easley had 35 tackles, 3.5 sacks, and 2 forced fumbles in a reserve role with the Rams in 2017. In 2018, he had just 4 tackles in 3 games. He had surgery to repair a meniscus. • DT Morgan Fox (IR): Fox is the guy who hit Wentz's leg on the play he tore his ACL and LCL. Fox himself now has an ACL tear of his own.